This costume was especially significant for me since it was my very first attempt at creating a homemade costume. I wanted something different, not store bought & all us crafters know that if you want something unique then handmade it the way to go! So I took a pair of his old overalls & altered it by adhering random squares of fall themed fabric patches on it along with natural colored rafetta to simulate the 'hay' coming out of his pockets and pant legs. I opted to not put any makeup on him since he'd rub that off in about 3 seconds after it being applied. The whole look came together with a burlap hat decorated with fall leaves & some more natural rafetta. He ended up being the only scarecrow that I saw that one Halloween & we received several comments on his costume. I was pleased with my little creation & patted myself on the back! :-) Not bad for my very first try I think! For this page I've used paper from Authentique's 'Mysterious' collection & the design is based on a sketch by The Nifty Pixel. The sketch used is part of a collection of digital templates by The Nifty Pixel. To find out more information on these templates feel free to check it out here. 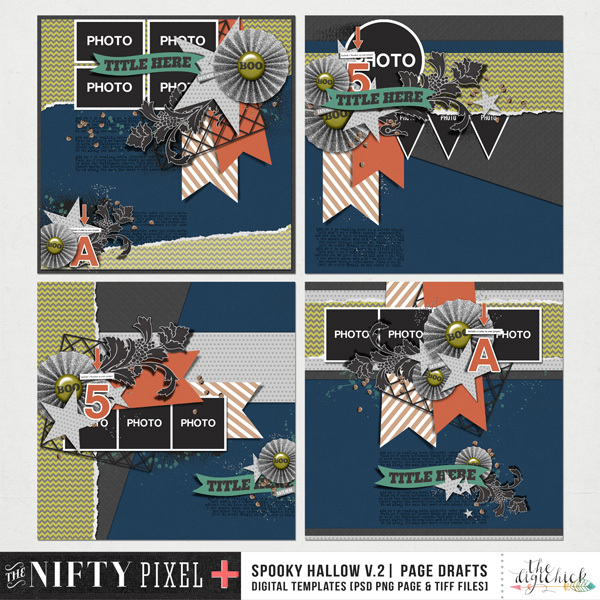 The Nifty Pixel also released a couple of Halloween themed digital packs appropriately named 'Trickery'. My layout is a hybrid page meaning that I printed some elements from the 'Trickery' digital pack & used them on my page. So these packs can be used for both digital pages or to add unique flair to traditional pages. All of the flowers used on this page are by Petaloo. Supplies: Paper - Authentique, Embellishments - Authentique, The Nifty Pixel, Flowers - Petaloo, Other - Sequins, Rhinestones. Thanks for stopping by & have a happy & safe Halloween!